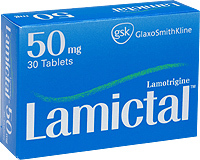 Common side effects of lamictal include dizziness, rash, coordination loss, difficulty concentrating, joint or stomach pain, speech problems, appetite loss, and blurred vision. More serious side effects are chest pain, headache, sensitivity to light, fever, or swelling. Skin rash is one of the most serious secondary effects of Lamictal, and may indicate a graver condition. None of these common side effects should last for extended periods of time. If they persist, patients should contact their physicians immediately, as that may signal an allergic reaction or more serious condition. A severe rash and fever are two of the most serious side effects of Lamictal, as it may indicate Stevens-Johnson Syndrome (a life threatening skin condition), the onset of meningitis, or DRESS Syndrome (which can cause organ inflammation). While most men are susceptible to the aforementioned list of side effects, studies show that women are more likely to experience one or more of these symptoms (which is not typical of other anticonvulsants). Women taking Lamictal are also prone to amenhorrea (missed or irregular periods), as well as painful menstrual cramps, and may also experience itching, burning, or swelling of the vaginal area. Furthermore, women who take estrogen-based birth control may need to take a higher dose of Lamictal, as it interferes with the efficacy of contraceptives. Lamictal is not recommended for women who are pregnant or breastfeeding, and should only be used if absolutely necessary. A 2006 study indicated that taking Lamictal in the first trimester could result in cleft palate formation in infants, although this is rare, and the chances congenital defects overall are generally considered to be low. Additionally, while Lamictal has been rated as “moderately safe” for nursing mothers by a scientific review, the effect of the drug’s transference to the newborn is not fully known. Lamictal has been approved for use in children as young as two years old, though it is typically in small doses prescribed according to weight. However, children have proven more prone to the life-threatening skin rashes and infections that may result from taking Lamictal. Because these rashes may erupt into the more serious DRESS or Stevens-Johnson Syndromes, the administration of the drug must be very closely monitored in children 12 and under. Weight gain is a reported side effect of Lamictal, though it is not very common. Studies indicate that less than 5% of people taking the drug as a treatment for bipolar disorder gained any weight. Interestingly, however, no individuals taking Lamictal as a treatment for seizures or epilepsy reported any weight gain. Because loss of appetite is also a side effect of taking the drug, some people may also experience weight loss toward the beginning of treatment. Lamictal should be avoided by pregnant women, as well as patients on other anticonvulsants (since this may actually increase seizure activity), and children prescribed the drug should be closely monitored. Still, Lamictal has been approved safe for use by the FDA. While it comes with an attached list of side effects, most often these are not serious (and the severe effects are rare), and it is an effective treatment of bipolar and epileptic disorders.